Who’s selling: REITs continue to sell non-strategic assets, increasing disposition volume by 5.4 percent quarter-over-quarter. Some institutional and private owners are selling primarily assets in secondary and tertiary markets. Who’s buying: Most active buyers are private investors looking for opportunistic and value-add assets. We are also seeing more developers purchasing existing assets where there are opportunities to reposition the property and achieve higher yields in comparison to new developments. What’s trading: Single asset transactions under $100 million reached $2.8 billion year-to-date, increasing overall this cycle from last as investors move away from riskier portfolio transactions. With buyers drawn to low-risk investments at the start of 2017, grocery-anchored shopping center transaction volume swelled 110 percent year-over-year, with $1.6 billion of product trading due to its stability and liquidity. Where: Transaction volumes into tertiary markets rose 54.2 percent over last year, as buyers are having a hard time finding quality product in primary and secondary markets due to cap rate compression. Primary market cap rates compressed 20 basis points to a low 4.3 percent, and 30 basis points to 4.6 percent in secondary markets. 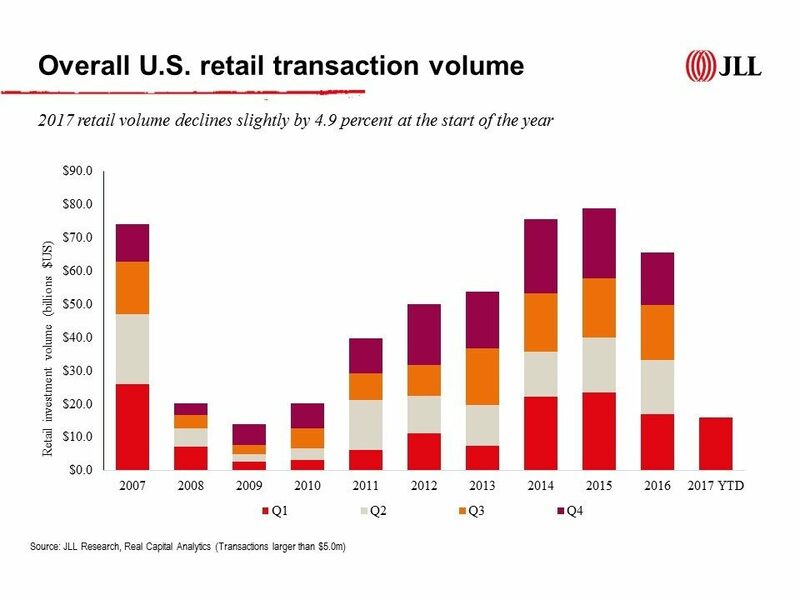 Primary and secondary transaction volumes still make-up 64 percent of total investment. Categories: Americas Retail, ICSC Events, Investment and tagged Investment, JLL, Margaret Caldwell, retail.